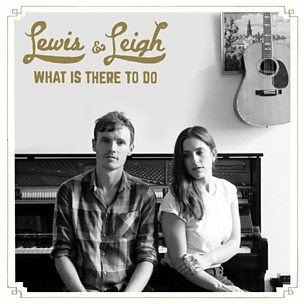 Lewis & Leigh "Night Drives"
Al Lewis and Alva Leigh comprise Americana duo Lewis & Leigh. Hailing from Wales and Mississippi respectively, the duo are set to release their debut EP, Night Drives, on 6th October. The EP opens with lead single What Is There To Do and also includes All Night Drive, Anchor Line and Say You Miss Me. The steady drum beat and acoustic guitar hook throughout What Is There To Do gives a strong back drop for both Al and Alva to showcase their strong voices and also gives the track a sense of pace that will keep listeners interested. The duo's voices sound at ease and comfortable with the track and they complement each other well. What Is There To Do is then followed by All Night Drive. The track has a slight haunting quality, due to the softness of the production and vocals. Lyrics such as "will you wait for me on the other side, it's an all night drive" and "even when I'm home, it's strange how we both feel alone" prompt the listener to pay close attention to the track in order to really follow the message of hurt behind the lyrics. The build and fade of the production at key moments also works well. The duo continue to share lead vocals throughout Anchor Line. One of the slower numbers on the EP, the track centres around lyrics such as "all I want is to love somebody and for it to be true". With a production that is led by acoustic guitar and snare drum and travels smoothly through the track with various pace changes, it remains appealing when, at first listen, it could feel as though it will become boring. The EP is closed by Say You Miss Me - a cover of one of their favourite songs from Chicago based rock band Wilco. Whilst the track is not drastically different from other songs on the EP, the fact that this is not a full length album full of the same sort of tracks means that listeners will be swept through the tracks on the strength of the duo's vocals, the lyrics and the musicianship shown. Overall I would say it is definitely worth listening to this EP. Al and Alva are unashamedly Americana and they deliver it very well. Looking forward to a future full length album, I hope they include enough different paces and ideas within their tracks to keep listeners interested - I'd be interested to hear what they produce but I am certainly impressed by this first journey into their music! Their EP launch show is 21st October at the Betsey Trotwood in London and you can buy tickets here. Labels: Lewis & Leigh "Night Drives"